Do you struggle with selling digital products online? Or are you not making enough ROI? Although this can work depending on your product and market, a lot of the time you either will have a low conversion rate or you won’t make enough money. The good thing is, there is a better way to all of this. A way where you can have increase leads, skyrocket conversion rates and multiply your average cart value. The goal with the product sales funnel is to qualify buyers by offering them an irresistible low ticket item. After the customer has purchased the low ticket item, you will offer them upsells and downsells to increase the average cart value. The goal with this funnel is to break-even with ad spend and ascend them up your value ladder where you make the real money. The Dollar Beard Club is an exclusive club which is ONLY $1/mo to sign up (with the $1/mo you get beard oils delivered to your door). The product sales funnel is a one of the best sales funnel out there and if you can execute on this right… you’ll be able to 10x your sales overnight. 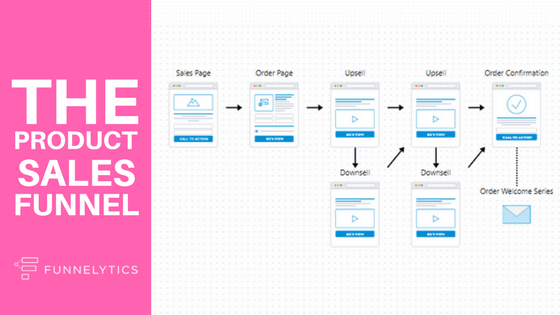 If you want to map out your own funnels (just like this product sales one), make sure to check out our free mapping tool at www.funnelytics.io.